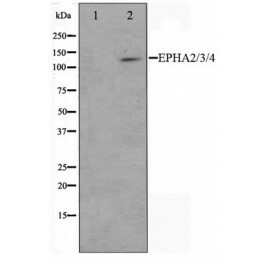 The immunogen for anti-EPHA2/3/4 Antibody: A synthesized peptide derived from human EPHA2/3/4. 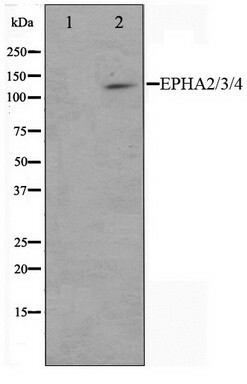 EphA2 a receptor tyrosine kise. Receptor for members of the ephrin-A family. Binds to ephrin-A1, -A3, -A4 AND -A5. The Eph receptor tyrosine kise family, the largest in the tyrosine kise group, has fourteen members. They bind membrane-anchored ligands, ephrins, at sites of cell-cell contact, regulating the repulsion and adhesion of cells that underlie the establishment, maintence, and remodeling of patterns of cellular organization. Eph sigls are particularly important in regulating cell adhesion and cell migration during development, axon guidance, homeostasis and disease.